Learn about what we’re doing, learning, and discovering as technical theatre students at the University at Buffalo. As a future costume designer, a part of the design process that specifically interests me, are the costume accessories. Specifically in this matter, I’m referring to hats. I was lucky enough that one of my classes was given the opportunity to visit a milliner located in Buffalo, NY (“Custom Hatter”, owned by proprietor Gary White). Mr. White has created custom hats for movies, television, theatre, and personal use, all by hand; his hats are truly a work of art and careful design decisions. This visit definitely inspired me to continue pursuing my passion of costume design, with the hope that in my future career I will continue to be as passionate and excited about my work and process. His website can be found at <http://custom-hatter.com/>, and includes a description of his process in creating the custom hats. Last night, I had the pleasure of attending the Russian National Ballet’s performance of Swan Lake. I had never attended a full ballet before so only the music and the white swan costumes were familiar and expected. I enjoyed it immensely but would like to just share what I saw as a theatre design student (currently focused on costume). I payed the most attention to how the characters were obviously identified as groups by colors and patterns. In the second act, for example, when the princesses are dancing with their visiting court members, each of the four groups had a separate color palette. The princesses had similar costumes but were distinguished by their bodice designs and Juliet sleeve variations. As for Odette, all she had that distinguished her as the Swan Queen was her tiara and what looked like beading on her bodice. Simple, but effective. I do have to make a point to mention the costume for Rothbart. What I liked about it was that it was dark, detailed, and it had a cape which really lent itself to how ‘shadowy’ his movements were. All in all, I thought the performance was great and the costumes were lovely. I liked being able to see the richness of the fabrics and the different colored layers of the tutus enhance the dancers’ movements. I look forward to attending more ballets in the future. As my senior year winds down I find my future heating up. Since November, or really since the moment I began undergrad, I have been looking towards the future, specifically towards Grad School. I have traveled all over the country in the last year to look at different schools and options. In the fall I had my first grad school visit to Arizona State University (“ASU”). I was positive that it was the one. I was visiting for a program in Performance Design, or the art of the total picture combined with devised theater. On paper it was incredible, it was everything I needed, but in reality it was far from it. It became apparent that I was not right for them and they were not right for me. So I moved on to what I was sure was the next right option. I wanted to be a director. I had just completed two devised performances, both of which I wrote, directed and designed. One in Poland at Teatr Arka, an integration theater for the mentally handicapped, and one as my senior capstone project called Murder of Simplicity. Both of which made me feel like a true artist. I was in control of an idea, a thought, and I was having an intellectual dialogue of energy with my audience. I began chasing directing grad schools through the URTA process. I had to do an incredible amount of writing including, but not limited to, directorial philosophies, cover letters, artist statements and many more specific to schools. I had several interviews, and at each one it was reaffirmed that I have very interesting ideas, and a strong grasp of image, but that I am very young, and that taking me would be a risk. I continued my hunt by applying as a Scenographer, the art of the total image, to the URTA design schools as well. Originally I was doing this just as a side to my directing schools to see what would happen, but it became swiftly apparent that to become a powerful designer of image I had to go to school for that, and could always go back to being a director. Then being able to utilize the tools an MFA in design would hand to me. Following URTAs I had three major schools I was looking at, California Institute of the Arts (“Calarts”) – where I had also applied as a director, Ohio University (“OU”), and University of Missouri-Kansas City (“UMKC”). All three seemed to be a good fit with excellent mentors whom I could see myself learning under for the next three to four years of my life. At Calarts I was being looked at as a Costume Design student, at OU I was being looked at as a Scenographer, and UMKC I was being looked at as a Costume and Lighting Designer. My first visit was to UMKC. I had a four-day visit there, three days with the lighting department, and one with the costume department. It was scheduled to snow, but being from Buffalo I thought nothing of it. The school closed for two whole days. It snowed two feet and the entire city shut down. I had forgotten that other cities weren’t as prepared for snow as Buffalo, but luckily I still was able to have my visit and get to see the facilities, meet the students, and talk to the professors. By the fourth day I was completely enamored with what the school had to offer. Between the sheer artistry present in every rendering the students make, to the volume of work they create, to the international network the school has created for itself, and even the city (who know I would love Kansas City?- not me that’s for sure. ), everything just felt right. Leaving the school I had made my decision. If they were to give me an offer, I would accept. Within the week I had received an offer, and without visiting any other schools, with the guidance of my professors, peers, and colleagues, I accepted. I just knew it would be perfect, it felt right, and much like dating- when you meet the right person you don’t need to go on a first date with the other three potentials. I sent out my “Thank you, but I must end our conversation” emails to OU and Calarts, and moved on, back to finishing my senior year. For the first time in months I felt able to relax about my skills, ideas, abilities, and of course my future. Epilogue: I received an acceptance letter from Calarts shortly after sending my email declaration of non-intent to them. It was like looking at a life that could have been. What it made me aware of was that I had made the right choice, as I felt only a momentary twinge of regret in not visiting before moving on and remembering how incredible it felt to be a future UMKC student. A major life goal of mine is to create theater in the way that Pilobolus creates modern dance. Their company works circularly, starting with a wide basin of material from which they devise a performance as a group, spiraling to a central focus of the work. This is what appears on stage. Their company begins working with a huge amount of information, but presents only a small amount of it to the audience, creating a concise and clear idea, or message. Pilobolus’s hierarchy is based entirely upon experience. The younger performers’ opinions and ideas are given significant weight, but the eyes and ears of the more experienced performers shape the impulses of the ensemble. This approach would, I believe, also create the most powerful theater, a theater that is always fresh, yet polished. This is what it means to bring together generations of artists. There is a loving harshness in all critiques, to help each other grow rapidly. I hope to work in several such companies and eventually found and develop one. In Murder of Simplicity (http://maxarchimedes.com/Design_Portfolio/Pages/Murder_of_Simplicity.html), a work that I conceived, directed, and designed in collaboration with an ensemble of performers, we employed this type of circular, spiraling creative process. Such work is difficult to separate into individual design elements because they affected each other heavily, guiding each other’s development. This world, in which performers, directors, and designers are the same people, readily giving and taking from each other, made us all aware of the intimacy of our work, resulting in total pictures and the most intense observer experience. My approach to Murder of Simplicity differs greatly from the more conventional notion of distinct separation of each facet of design that I encountered as a student designer. For example, in my junior year of undergraduate study at the University at Buffalo (“UB”) I designed costumes for a production of Hedda Gabler (http://maxarchimedes.com/Design_Portfolio/Pages/Hedda_Gabler.html). This production seemed somewhat disjointed, as if the elements of the design had never come together, which was largely the response from the KCACTF respondent. When each part of the design was presented separately at regionals, the designs were very well received. Each designer created a finished whole, but we never found the same center point. Had we walked the circle together, I think we could have covered more ground and discovered new material, gestures, and shapes cohesively instead of separately. I have found that when my work has been most effective in communicating feelings and ideas to the observer, it has always started with images. As a director, I begin building a show like I begin working on a design: I look for inspiration from other artist’s pictures. Whether it be young artists whom I know personally, or experienced artists whom I have found through magazines or the internet, other artists exert a strong influence on me. Throughout my process I use images for many different purposes. They will, of course, inspire my designs, but they may also suggest shapes for actors, lines for movement, and even feelings for entire scenes. I will often ask my performers to draw with me or make collages to share a concrete sense of what we’re feeling, beyond words. The use of image as communication inspires me as a person and an artist, yet image is only part of my creative approach. Music exerts an equally powerful influence on my process. Music incites my entire body to inspiration, in a way that I would not be able to capture otherwise. It fills me with ideas, and I use it throughout the entire rehearsal process and in performance to help create mood and stimulate thought for the performers. This gives my work a cinematic presence in the way the action moves from one moment to the next. A finished production could feel like a concept album we have created from other people’s musical expressions. I frequently sample and mash up music to create tracks for rehearsal and production in order to amplify the emotional arc of a theatrical experiment. In my work, the observer experience, while created and intensified by picture, sound, and music, is always grounded in the intensity of the performer. The energy of the people on stage is the most important part of theater: its pulse, its rhythm, its core. For this reason, every time I direct, I aim to unlock the active core of the actor’s body. I focus on relaxation, movement, and impulse, aiming to expand the performer’s personal movement patterns. In rehearsal, I do not use the word “character.” I prefer my performers to take the person they are becoming to heart and not think of them as a distanced notion of a “character” on a page, but as a living, breathing entity integrated into their own beings. If the core is active and the actors have put themselves into the performance, then they will always be the most interesting element of the picture. For me, the audience is a performer who hasn’t been overtly asked to perform. By breaking the imaginary fourth wall, I give them permission to make choices within the performance. They may be touched by performers or talk to performers. I sometimes take away comforting conventions such as bows, to create a more immediate and active observer. In the tradition of Epic theater, I see it as my job not to mesmerize them with entertainment, but to force them out of their comfort zones. This may create unease in the audience, which I sometimes seek. I aim to create emotion in everyone that participates in or with my work. I aspire to create conversations through dissonance. I spent the summer of 2012 working as a director and scenographer of new work at Teatr Arka in Wroclaw, Poland – already achieving one of my life goals of working in Eastern European theater. I am currently in negotiation to return to Teatr Arka in summer 2013 with another project. Part of their approach is to follow their instincts and ideas from beginning to end before making a decision on whether or not the impulse was worthwhile. They treat themselves the way a painter does. They plan for a while, but when rehearsal or the artisan process takes over, they abandon plans in favor of new impulses. Working with this company has helped me grow exponentially. This company has developed my ability to have full trust in my instincts while remaining open to the strong constructive critique of my collaborators. In the production that I created for Teatr Arka, Silence (http://maxarchimedes.com/Design_Portfolio/Pages/Silence.html), we removed a curtain call, and the audience would applaud at the end, hoping to call the performers back on stage. Finally the audience would concede, realizing that their applause could not force the actors back into the “real world.” The story would stand alone, untouched by the performer’s reality. The art of ending a show cleanly, yet without conflicting with the spirit of the performance, is something that I aim to craft and shape seamlessly. I do not believe that conventional bows are required; instead, I look to close the book on the characters and their stories, and allow these narratives to end as if they were real. During the time they are on stage, they are real and true, so why break that illusion in the name of convention? I am interested in working with the strongest designers, directors, actors, and collaborators that I can find; people who wish to devote their lives to art. Ensembles and collaboratives comprised of such committed artists may produce huge failures as well as huge successes. This suits me, as I am uninterested in being safe, average, or mediocre. I believe that if a work of art pleases everyone, with rare exception, it has not taken enough chances; it has not fought hard enough for a goal or vision. I seek to make theater that is complicated, controversial, and frequently ambiguous. Not everyone will appreciate all of my work all of the time, but I hope they will always have something to say about it. In class we had a conversation about portfolios with Cathy. I don’t come from a design background and I’m used to just adding onto my resume from my acting experience. Normally a headshot and resume are enough. But after this, especially with me trying to move myself into the shoes of a director, I’ve realized I need to take a more photo friendly approach to projects I’m working on. I’ve directed two short one act pieces here at UB and the only thing I have to offer up as proof of that is my actors word that these pieces really happened (haha at my life), and maybe a saved program and poster from the first one act I wrote and directed in Directing 1 class with Professor Kaz. As we move forward in design sem, I’m becoming more aware that I need to be saving just about everything that I create or that I share with the design team for Urinetown–so I have something to present as my final portfolio at the end of the semester. I will definitely be portfolio ready be the end of this class, especially after seeing how amazing some of our classmates’ portfolios turned out. Originally when designing the costumes for the Emerging Choreographer’s Showcase (ECS), I shied away from the idea of using unitards. For those of you who are not aware, unitards is the term for a dance outfit with the top of a leotard, but which instead continues down the length of the dancer’s leg. As a designer, I have a tendency to view them more as a distraction to the movement, which flattens the organic shape of the dancer’s body to create different lines. In the process of designing the costumes, many revisions were made through conversations with the choreographers in order to create a performance that captured both their vision along with my own. One dramatic turn, was the last piece of the performance, which included the use of sand. Originally, my design included multiple layers with light fabric which flowed and separated from the body; however, through collaborative efforts and clear communication, I revised the design to include unitards for the dancers. This change not only helped to solidify the vision of the choreographer, but the combination of the sand and the unitards created a visually dynamic design, which was much more intense. As a designer, collaboration is one key to the success of my designs. Part of that is not only being true to my own vision, but the ability to move beyond my personal holdbacks, in order to create a design that becomes much more than its original parts. 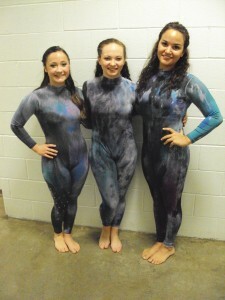 Picture Note: This is a picture of the three dancers in the ECS piece “Hourglass”, which is referenced above. The picture was taken by myself (Rachel Maggs). During my first meeting with Dan Bartunek he gave all of the other props people and myself a tour of the warehouse. Once he established a general idea of where all of the types of props were, he began discussing with me his plans for the reorganization of the warehouse over the course of the semester. As Dan spoke I found it very difficult to keep up with all of what he was saying, and I couldn’t help but wonder if I, by my lonesome, would be able to meet all of these tasks that he was putting in front of me. Dan seemed confident enough, I did not. My first big task, and one of the most important in the complete reorganization of the props warehouse was measuring all of the rugs on a giant steel rack and then getting rid of the rack itself. I went to the warehouse and over the course of several days, with the assistance of a measuring tape, a Sharpie marker, and a small roll of white gaffer’s tape, I began to unfurl all of the rugs, get their height and length, and then reroll them and place them somewhere that wasn’t on the rack. Once I had gotten the rack almost completely empty, I was faced with another challenge. Some previous person had, for some unknown reason, decided that the best place to put a cast-iron tub was on top of this steel rack, where it very easily got lodged between the box-steel frame. After a discussion with I believe Eric and Tom Burke (and possibly Tom Tucker) I was able to take a chain motor and, wrapping two span sets around the tub, lift the thing out and safely set it down on the ground. After that, getting rid of the steel rack was as simple as taking a ban saw to it and cutting it into small, manageable pieces. Needless to say, Dan was ecstatic when he saw the amount of space this freed up in the warehouse. After that, and between my visits to the props warehouse, Dan had managed to get a group of production practicum lab students to disassemble a rack that was on the upstairs and reassemble it on the downstairs where the steel rack had been. This rack became populated by all of the couches in the warehouse, with Dan’s thinking being that it didn’t make sense to have to carry heavy couches up and down stairs. This also allowed Dan to have more space upstairs where there was a few more racks. Dan himself was surprised at the progress being made, saying on more than one occasion that we had accomplished more in a couple of weeks than he had expected us to do all semester. We then utilized a Design Sem breakout session and a late lab class to move another rack, and flip it’s orientation. Suddenly we had even more space upstairs and a rack full of nothing but chairs. We seemed to be on a real tear, but we had slow down as both “Road to Glory” and “Three-Penny” kicked into heavy production and my services were needed elsewhere, whether it be on a paint call where I learned to scumble, or if I was building props that eventually ended up getting cut from the show anyway. Our last big push came during the strike of “Three-Penny”. After all of the props had been returned to us, Dan and I again utilized all of the people that had shown up to the strike to our advantage. We flipped and rearranged the remaining racks on the upstairs level, fulfilling Dan’s vision of having walkable isles instead of a big mess in front of the racks that were pushed the long way against the wall. Even after all of this, Dan refused to stop and pushed up further, completely rearranging the downstairs, especially the side under the upper level. I emptied the two steel chair racks that had been buried in there and handed the chairs off to other students who took them up to Dan to be put on one of the now two tall chair racks upstairs. We then moved the lower racks into the shop for them to be dismantled and preceded to move the bench rack, tables, desks, and even a doorway under there with plenty of room to spare. Now at the end of the semester the props warehouse looks completely different. Dan’s ultimate goal of making it more navigable, and making props easier to find and reach is pretty close to true. But like with anything, it’s not finished, and I hope whoever takes over my position next semester will continue to make that room the best that it can. We’ve already done the hardest work in there, thought, so it will certainly be easy for them. Emerging Choreographers’ Showcase opened and closed this past week at the University at Buffalo. I had the pleasure of designing the lighting for the piece that Dana Bojarski choreographed. It was an interesting experience designing for the first time at this school, as I am only a freshman. However, I felt very prepared by the time the show came around and was overall pretty happy with the way my design turned out in the end. After seeing the piece of the first time, I felt like Dana, through her dance, was trying to create an eerie and distorted organic environment. I knew I wanted to primarily manipulate color and angle of light to achieve my design concept. However, when working with a set repertory dance lighting plot, this can often be difficult to do. After watching my piece more and more, I realized I wanted low angle sidelight to cast distorted and unnatural shadows across the dancers along with haze to add to the spine-chilling environment. Due to the fact that there were not any lighting booms in the show, I had to request specials that would be placed on the deck. Thankfully, time and inventory allowed me to get what I wanted. Once technical rehearsals started, I was happy to see the progress that was coming along with my piece. However, I wasn’t satisfied with the hot “spanked pink” color that I chose to come from my specials. I experimented in the light lab after my piece was finished rehearsing one night and came up with the combination of R96, R40, and R135. Seeing the new color the next day definitely was more effective at achieving my design objective. Overall, I was very happy with the way my piece turned out for Emerging Choreographers’ Showcase and was very proud of my fellow designers. However, a note to the wise: make sure the gel in your specials gets properly swapped before the next show! In my high school’s drama club, I constantly took photos. I took photos of the set (in-progress and finished) and of the actors. But they were scrapbook photos and not solely for showing what I worked on. Now that I am on the track of becoming a professional and have survived my first show design (even as an assistant), I have discovered just how important photos of my work are. There were many times I arrived at the costume shop for the day and later thought “I wish I had my camera”. It is much easier to show progress in photos than in words. Knowing that whatever I do is potentially going in my professional portfolio will definitely be in the back of my mind as I continue my work in theatre…with my camera at my side. Something i discovered about myself was that i looooooove research. I absolutely adore it, and i never would have found that out if i didn’t do research like crazy. 🙂 I researched everything from shoes to hair, to hats, and even beggar images for my designs! Wanna see some of my research? of course you do! I started with ladies shoes, which were very hard for me to find anything on. But i learned that if you dig long enough, you are going to find yourself neck deep in images, and what a fabulous way to be! I found out a lot of information about the male shoes as well as hair for both sexes. One thing i learned the hard way was to double check the time period of your images before you select them and show them to your designer. I had to do research for the Cops, and i got a bunch of wonderful pictures, except that they were for like 3 totally different time periods. I didn’t know a police uniform could change that much in such a short period of time. Oh well lesson learned. When Lynn first approached me to be the Property Manager over the summer while I was working at Artpark, I was terrified. I had absolutely no idea what I would be doing, and if I’d be able to do it. But thankfully I was able to put it out of my mind until the first week of classes, when I was giving my packet. Now, at the end of the semester, I feel like I’ve been able to fulfill what was asked of me back in August. It took me a while to shake that fear which grounded me to the spot, and truth be told that fear is still there. But I’ve come to the realization that it’s better to press on and face it. We are after all, in an academic setting, and I’m fairly certain that no one in our theatre department wants to see us fail. I am glad that I was asked to be the props manager this semester, and look foreword to my further involvement as TD on Forgiving John Lennon. (cc) 2009-2013 (td)squared, content released under the terms of the Creative Commons Attribution Non-Commercial Share-Alike 3.0 License.